T has always been obsessed with snow globes. Obsessed! She loves the them, and oohs and aahs every time we see one in the store. The ONLY ornament she dared to pluck from my Christmas tree this year was a tiny snow globe, and I had a tough job to get her to give that sucker back up. She just adores them. 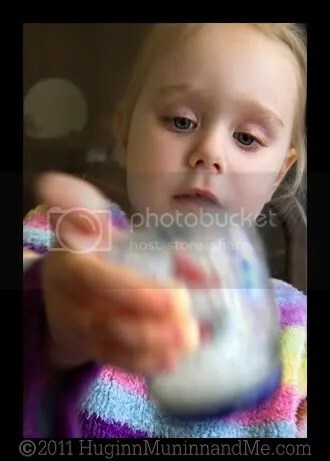 . . unfortunately, at the age of three (or two, or one) grace isn’t something that comes naturally, so on the three occasions that I was brave enough to buy the girl a snow globe, it ended up shattered on my floor in 30 seconds flat (no joke). Poor little kid went from ecstatic to heartbroken, and I just felt BAD. Needless to say, it was decided that the whole snow globe thing ought to be put on hold for a few years. . . But then one day I accidentally dropped a baby food jar. It was fine. I picked it up, and it slipped from my grip again. Then I dropped it a third time intentionally, because EVERYONE knows the third time’s the charm. . . still intact! THAT was when the little light bulb that I love so dearly popped on over my head. . . So first, we had to find something cute for the inside. 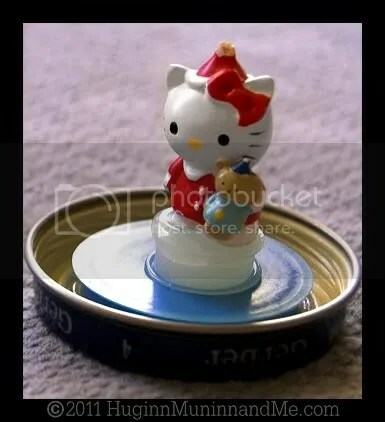 I just so happened to have a Hello Kitty mini tree ornament lying around. The hook had broken, and I never had gotten around to repairing it. PERFECT. She was a smidge on the short side, so we hot glued a milk cap and then a random plastic thingie (we searched the house for something the perfect size – that was half the fun!) inside of the baby food jar to give her a bit of extra height. T says it’s her ‘snow pile.’ Then we glued HK on top of the cap and the thingie. Next we shook in some glitter! A bit of this kind a pinch of that – whatever T thought looked ‘snowy’ enough! Then the wet stuff. 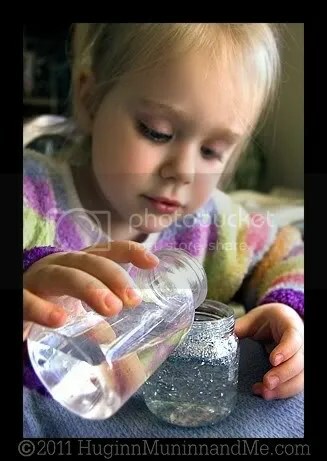 T helped me mix water, vinegar (to help prevent any grossness from growing in there), and corn syrup (to give it a bit of extra thickness for the ‘snow’ to float in), then she filled our little jar up to the top. 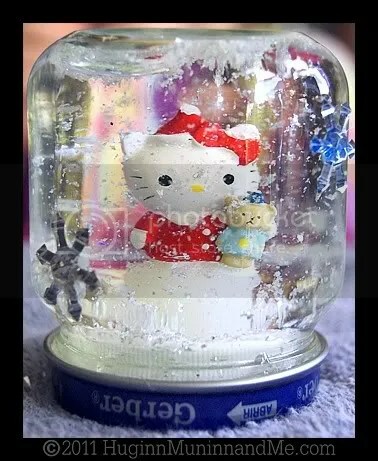 Finally, I ran a bead of hot glue around the top of the jar, and put the lid (with Hello Kitty firmly attached to it) back on. 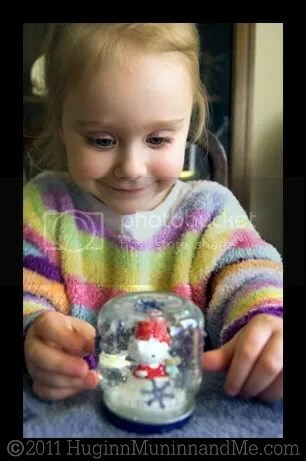 We let the glue harden for a minute, during which time T decorated the outside of the globe with a few snowflake ‘gems,’ and when that was done T gave her new creation a shake!
. . . and happily watched the snow come down! That is the coolest craft project ever!!!!! That is SO cool! I love this idea. 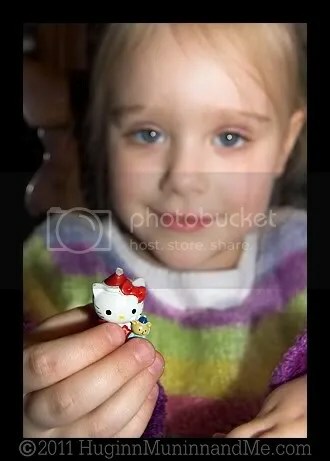 My daughter’s first tiny snowglobe was also broken in less than 30 seconds. We relate to you over here! Teagan’s globe is so special, you can just tell from her expression how enamored she is of her wintery creation. The hello kitty with that little teddy bear in one arm is a super cute centerpiece. This is one of those crafts that touches the heart. BTW, how clever to add vinegar and corn syrup . . . .
That’s the kind of craft you enter in a contest! How wonderful. I have a ton of the baby food jars here (the little ones). I haven’t figured out what to do with them (the larger ones are going to be for different jams this summer to give away). Cool idea! Very cute!!! I love it, it’s sooo cute! I totally wanted to make something like this for my girls this year, but just never got around to it. What is it with kids and snow globes? And I love love LOVE this project. It looks like it turned out great and it’s utter brilliance! You’re so wonderfully crafty. that is COOL! i want a teaball snoglobe! Really cool. We never did this one. I wish that I had thought of it. You go girl! How much corn syrup do u use in each jar?